We’ve all seen it before: The Levitating Woman. It has to be one the oldest illusions in the history of stage magic. It’s one of those tricks where you would never be able to figure out how it works unless someone told you. You’re about to see why in just a minute. What the trick looks like? Once the woman lies down, a sheet is draped over the board. The lifted sheet gives the audience the impression that only the two chairs at the end of the board are holding it up. The magician then puts the pretty lady in a trance and slowly raises his hands. Two assistants remove the chairs. The lady magically floats up under his hands. The assistant next to him hands him a hoop, which is drawn over the board so that the lady passes through the middle of it. Next, he slowly lowers his hands and the lady floats down gently. The assistants put the chairs back to catch the pretty little lady. They unwrap her and she sits up, swinging her legs over the side of the board. So now you want to know what really happened. The board is actually being held up by metal rod in the back of the board. The chairs do nothing at all. They are only there for illusion. When the magician isn’t standing there, the rod is clearly visible. But the magician blocks the rod from view with his legs. The platform that the magician is standing on is the biggest key to this trick. Under his feet are two hidden buttons which allows him to control the mechanism up and down. These gears are what raise up that pretty little lady with the touch of a button under his foot. So how does he make the hoop pass through? 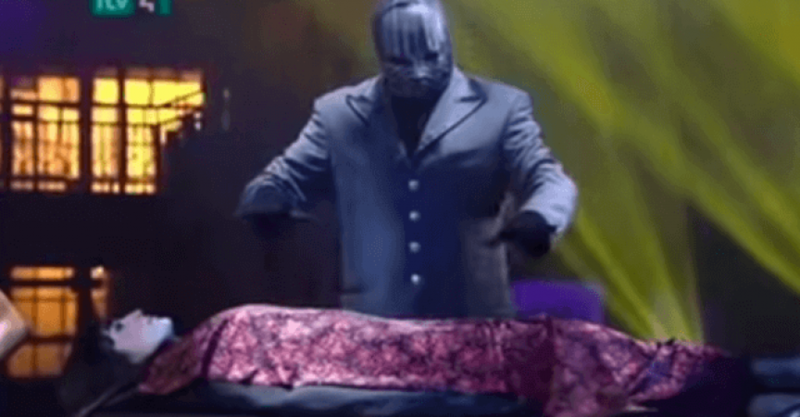 That metal rod that the magician is hiding with his legs are attached to the board the woman is laying on in a very specific design. It is designed specifically for the hoop! 1. So on the first pass that hoop is brought to the bend of the S.
2. The second pass he does is to untangle the hoop so that he can hand it to the assistant. This all might sound complicating, but it’s really not. It’s all a prop trick that any magician can do with just the right equipment. Take a look at the entire performance below. What makes this trick so cool is that you are not even looking at the magician’s legs. You are so mesmerized by the hoop going around that even if he stepped out of the way so that you could catch a glimpse of the rod, you would probably miss it anyway. It is really easy to see why this trick is so popular. It is fun, fast, and completely mesmerizing.